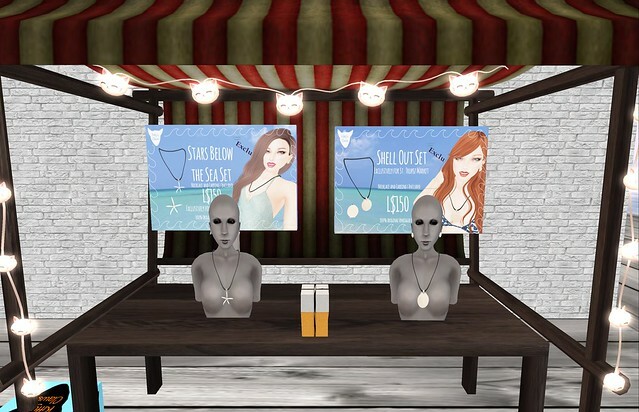 I am giving a tiny preview of my items for the St. Tropez Market Event that runs July 17th to August 27th! I created two summery sets (both include a necklace and earrings), one a starfish and a seashell. They are both at a great price, only $150 per set. There will be a gift at the event (which I will show you later) for only four days (the first two and the last two days). This gift will be retired, so you MUST stop by my kiosk and grab it during those days! I will set out an LM (or just go to my Events page) when the gift is out on my Plurk and will mention it here!